In this week’s CIBC Presents Entrepreneurship 101 lecture on marketing, Peter Evans emphasized the importance of understanding the market segment your business aims to target. Entrepreneurs must consider all angles, such as competition, supply and distribution chains and adoption cycles to optimize success. A great example of a company overcoming slow adoption barriers in the aerospace and defense industries is Toronto-based nano-structured material technologies company, Integran Technologies Inc. According to this Globe and Mail article, Integran had to rethink how to get their technology into the market place faster. By expanding into the sports equipment market, which has a much faster adoption cycle, they established revenue streams quickly. Their technology is now being used to make lightweight, super-strong golf club shafts, squash rackets and baseball bats. 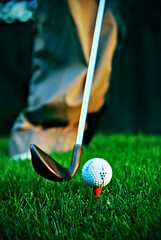 Integran executives have begun bringing a golf club shaft into pitch meetings. This gives potential buyers in the aerospace industry a tangible applied example of Integran technology and often provides that extra spark that helps them “get it”. Just one more example of how keeping and open mind and employing innovative and creative thinking can make or break a business venture.